Previous bags of stir fry greens have included broad bean tops, and I've thrown them into stir fries along with the rest. But when a whole bag of just broad bean tops arrived in this week's harvest I needed some fresh ideas. Here's one very tasty dinner. Enjoy! In a small saucepan, combine the cream, lemon zest, and a pinch of salt. Bring to a simmer and then cook over a low heat for 5 mins, stirring occasionally. The cream will thicken up considerably - you want this! Set aside. Pre-heat the oven to gas 5, and cook the salmon fillets for 10 mins. Flake with a fork and set aside. In a large saucepan, bring plenty of salted water to the boil. Cook the pasta for 2 mins less than the packet instructions state. When there are 3 mins remaining on the pasta cooking time, heat the olive oil in a large frying pan. Add the broad bean tops and cook for 30 seconds, stirring occasionally. 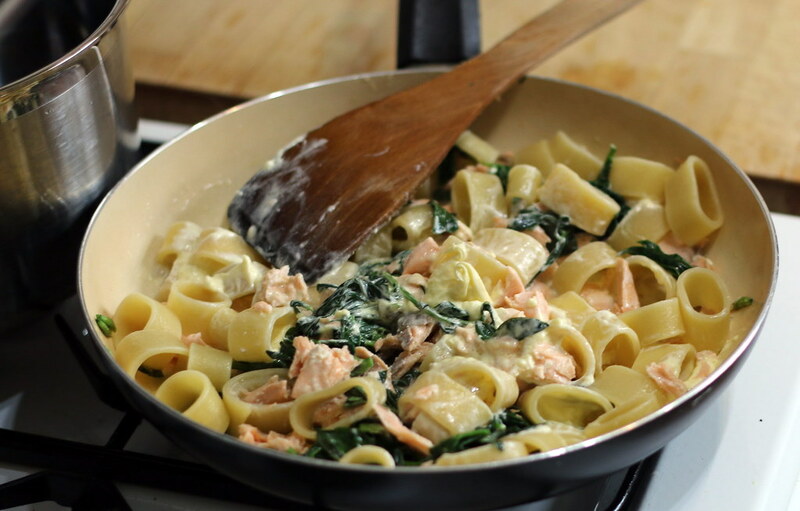 Add the salmon and reduced cream. By this point, the pasta should be cooked. Use a slotted spoon to transfer the pasta to the frying pan, along with some of the cooking water. This will help loosen up the sauce. Stir, season with black pepper, add the spring onion, and serve immediately. A crisp side salad is a good accompaniment.